Blackbeard is probably the most famous pirate in history who is celebrated to this day with an annual pirate festival in his honor, held in Hampton, Virginia, and with statues in the U.S. Virgin Islands and North Carolina. 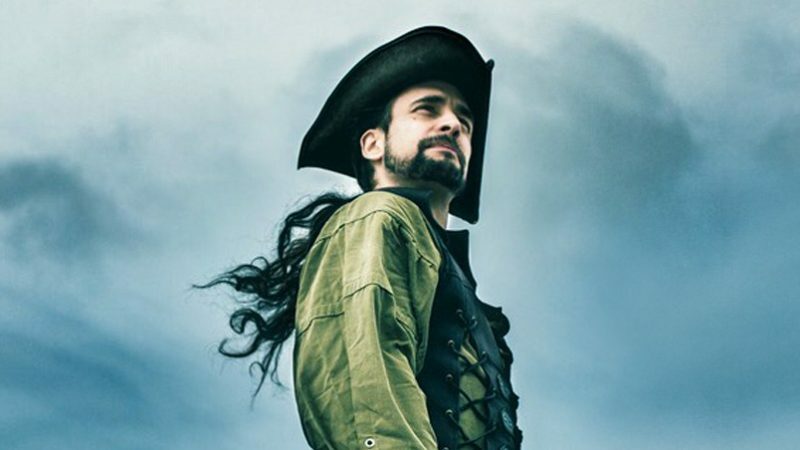 As for most pirates, very little is known about Blackbeard’s life. He was born as Edward Teach around 1680 in Bristol, England. 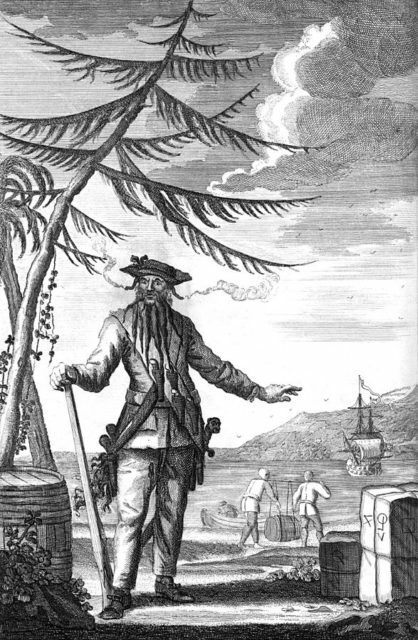 By 1717, he had his own, small fleet, and by mid-1718, Blackbeard was the most feared pirate in the Caribbean, and possibly the world. He seized his flagship, La Concorde, from the French and renamed her Queen Anne’s Revenge. It was a 200-ton ship with 16 cannons used in the slave trade, which Blackbeard equipped with an additional 40 guns. Blackbeard was so feared that often, when his victims spotted his distinctive flag of a skeleton spearing a heart, they simply surrendered, trading their cargo for their lives. While in Bath, North Carolina, Blackbeard even accepted a royal pardon from the Governor, the man with whom he traded the plundered goods. With a pardon in his pocket, Blackbeard thought himself above the law. 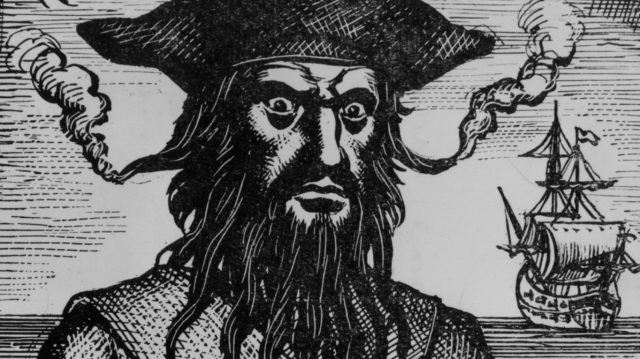 Captain Edward Teach, better known as Blackbeard, is said to have tucked slow-burning fuses into his beard and lit them on fire before plundering towns for gold and rum. However, he caught the eye of Alexander Spotswood, the Governor of Virginia, and remained there as a thorn. First, the governor wasn’t fond of pirates, and second, he received numerous complaints from local merchants and sailors who tired of being scared to do business on the water. 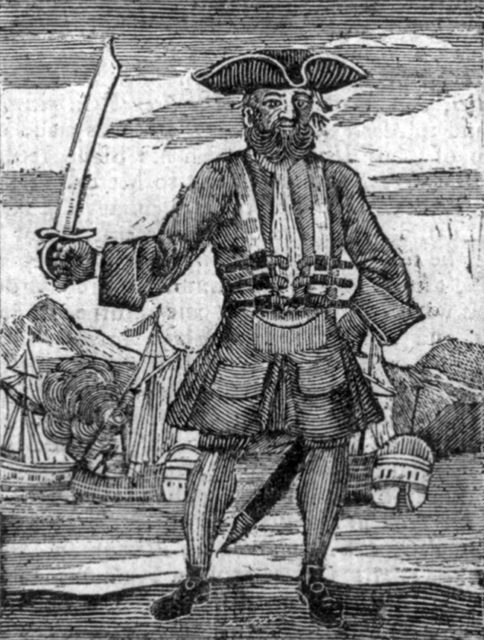 Spotswood assigned Lieutenant Robert Maynard to capture or kill the pirate Blackbeard. After learning that the pirate was in his base at Ocracoke Island, Maynard took two boats, Jane and Ranger, and embarked on a difficult mission. When Maynard and his pirate-chasing crew arrived at Ocracoke on the evening of November 21, 1718 they found the pirates drinking and celebrating with local merchants. 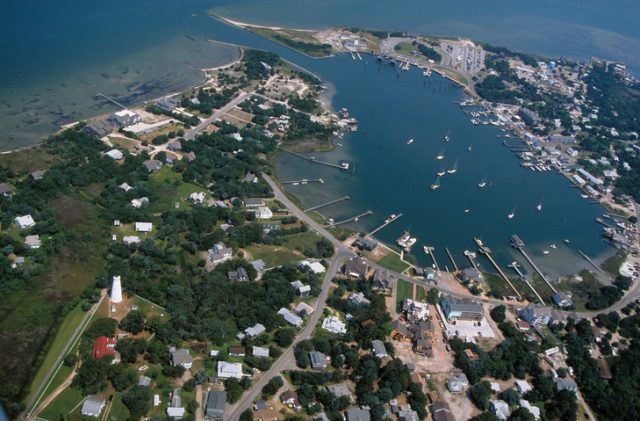 Anchoring in Ocracoke Inlet, Maynard prepared his men for a stealthy attack. Blackbeard battles Lt. Maynard at the height of the Golden Age of Piracy. 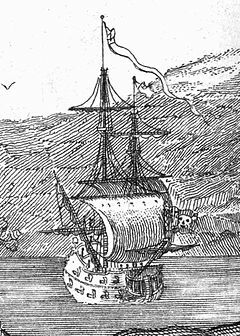 At the time, Blackbeard had lost the Queen Anne’s Revenge, and was roaming the Caribbean Sea with a much smaller ship, Adventure, equipped with only 10 guns. Although he was warned that there was a plot against him, he felt safe that night. At dawn, Jane and Ranger tried to sneak up on Adventure but got stuck on sandbars, and Blackbeard and his men noticed them in their predicament. Queen Anne’s Revenge, the flagship of Blackbeard the Pirate. There were only 25 pirates on Adventure that day and because of the lack of wind, the attacking boats were forced to use their oars. Knowing that he was outnumbered by his opponents, Blackbeard tried to escape while firing from his heavily loaded guns. But, although he knew those shallow waters quite well, his ship also ran aground. Firing on both ships, Blackbeard managed to cripple Ranger completely, killing around twenty soldiers along with the ship’s commander. At that moment Maynard, who was aboard Jane, came up with a genius plan that brought him victory. He ordered his men to hide below the deck while Jane sailed straight towards the pirate ship. As it got closer, Blackbeard fell for the trick and decided to board what he thought was an abandoned, empty ship. Robert Newton and Linda Darnell in Blackbeard the Pirate (1952). There were only 14 men left on Adventure, and they tied the two ships together. At that moment Maynard gave a signal to his men and they leaped into an attack. This was probably one of the most epic hand-to-hand conflicts like the ones we see in the movies. The most intense and dramatic was the one-on-one fight between Maynard and Blackbeard. 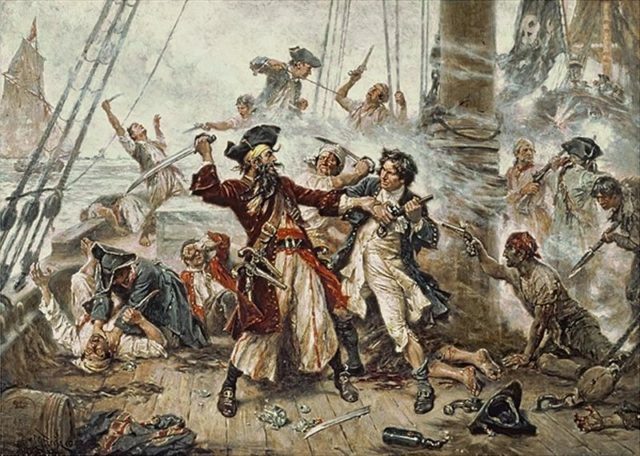 The Lieutenant wounded Blackbeard with a gunshot, but his sword broke during the fight and the pirate would have killed him if he had not been saved by one of his crew. After being saved, Maynard killed the pirate — who endured five gunshots and more than twenty wounds from Maynards blade. Blackbeard finally died from fatal cuts to his neck and throat. Maynard hung Blackbeard’s head off his bowsprit, tossed the body into the sea and headed home to collect the bounty on the former pirate’s head.